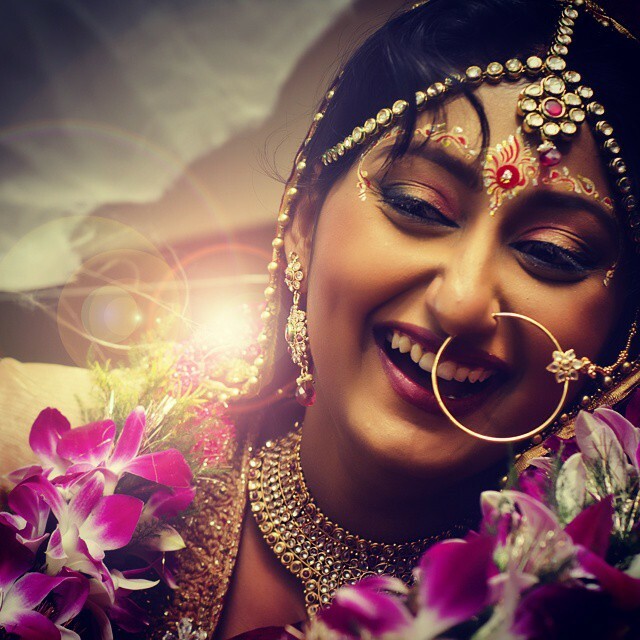 I am very glad to let you know that I have started a new section on my blog, “The Blushing Brides”, where you will be able to meet real brides and get a glimpse of their wedding. 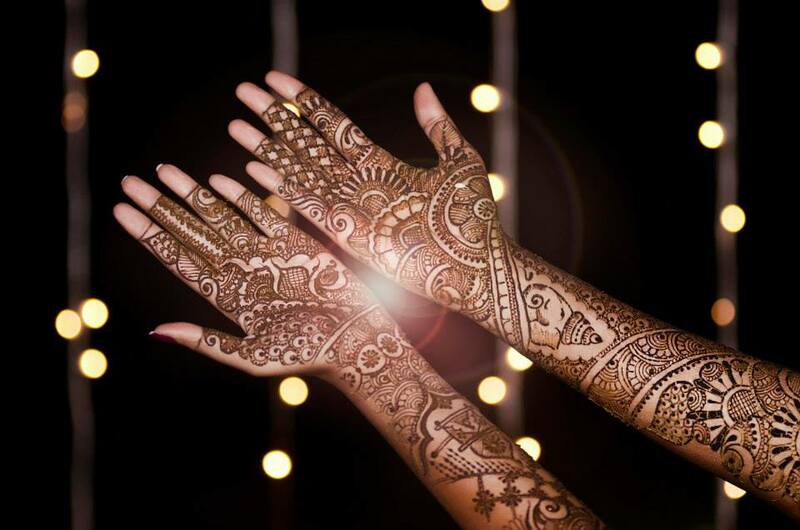 Yes, it is time to be inspired by our real brides. 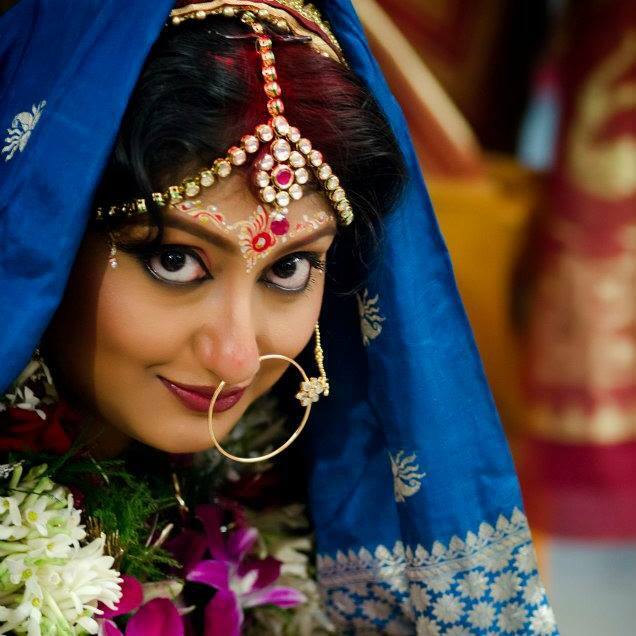 So, featuring first in this series is a bride from Kolkata, Sanandita Chakraverty. When I thought of starting this section, it was her name which came to my mind first. She made a really beautiful bride and I was truly mesmerized. Sanandita and Abhijit have a totally filmy love story. 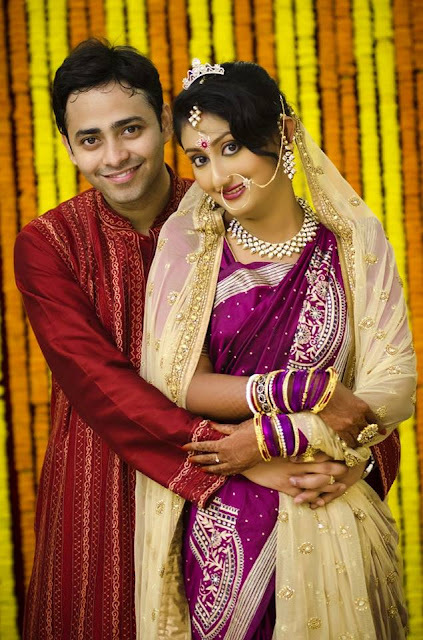 Hailing from Kolkata, Sanandita met the man of her dreams on her way back to Lucknow from Kolkata. She was a student of Dr. Ram Manohar Lohia National Law University, Lucknow and Abhijit Pal was going there for some office work. They had their seats right opposite to each other. They got to know each other on their way to Lucknow and exchanged numbers while parting ways. Abhijit who was already smitten by the girl didn’t take much time to realize that he had fallen for her. He visited Sanandita in her college and confessed his feelings. And rest is history…!! She got home after her exams and told her parents everything and soon marriage was on the cards. There are certain characteristics people possess that make them especially beautiful, like eyes, lips and cheekbones. But the importance of symmetry, i.e. when all facial features are lined up perfectly with one another, is something that to look out for. Sanandita has a fantastic looking face and the thing with her is she emanates all that's wonderful inside as well. I am personally in love with her eyes and her nose. 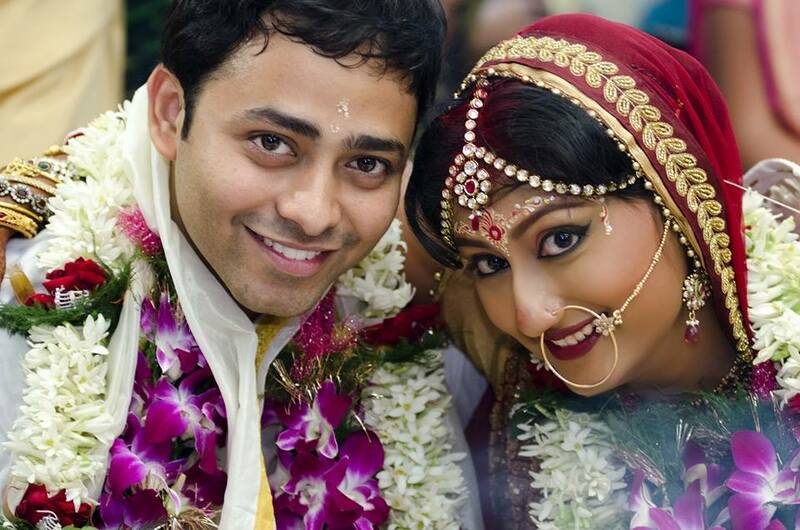 Ujjwal Debnath was her makeup artist for both her wedding and reception. What I really liked about her makeup was that the artist didn’t make her look ashy. She has a flawless complexion and Ujjwal Debnath just brought out the best in her. He did a perfect base which wasn’t looking cakey or unblended. Her face was beautifully contoured and highlighted. 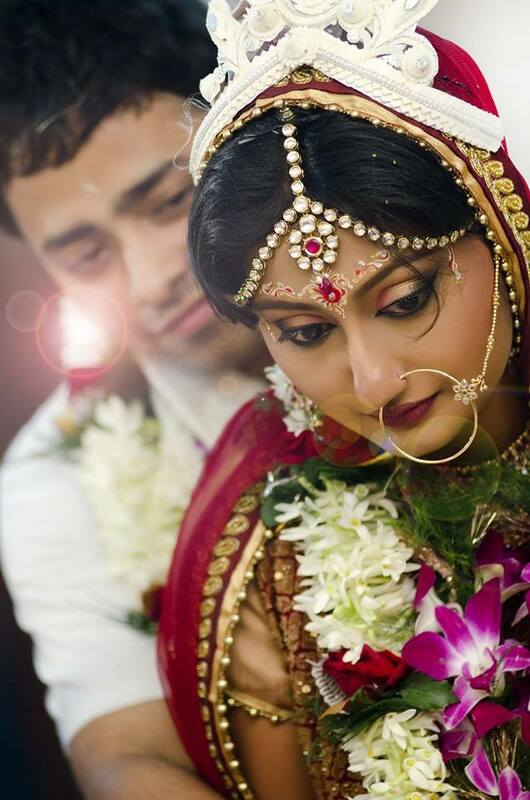 Coming to her eyes, he used perfect bridal colors to do her eye makeup. Rose gold on the inner one third of eyes, gold in the middle and dirty bronze on the outer one third. I liked the idea of using metallic gold on the middle; it really popped her dove eyes. Her eyes were lined with a black liquid liner which was further winged out. Wing liners look killer on her. Kohl was further used to line her waterline. Finally coats of mascara were used to finish off her eye makeup. 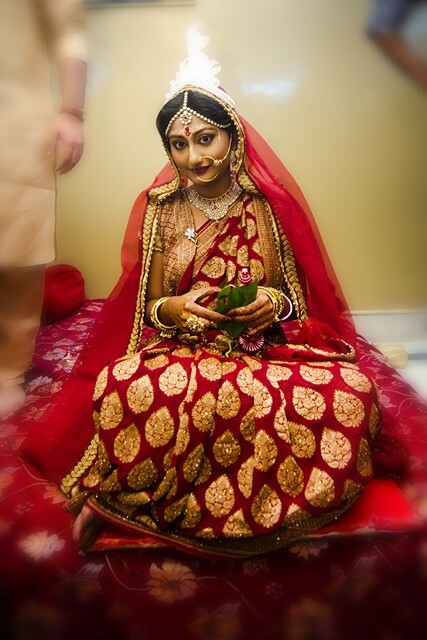 Rosy blush was used on the already blushing bride. For lips she went for dusky wine berry lips. Do you notice the blue benarasi saree here? It is her mother's wedding saree. She chose to include this saree just to keep her mother's special saree a part of her special day. So sweet..!! It is a common custom for Bengali brides to be draped in red benarasi sarees on their wedding day. But Sanandita chose to break the stereotype and went for a stunning dark red khaddi georgette saree. The saree had beautiful golden work and looked beautiful on her. Best part? It is not going to stay on her wardrobe untouched for years like a Benarasi. 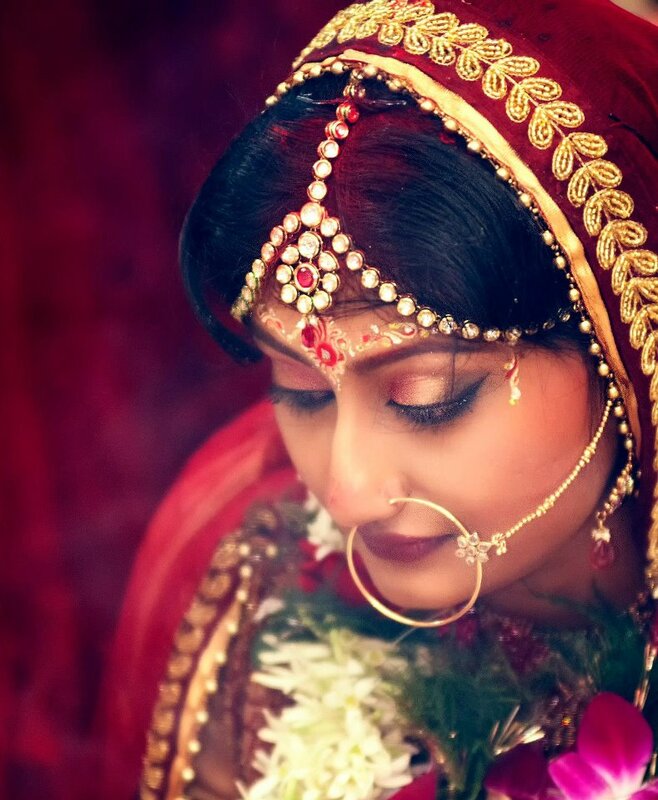 Her veil too was different from the regular veils worn by Bengali brides. 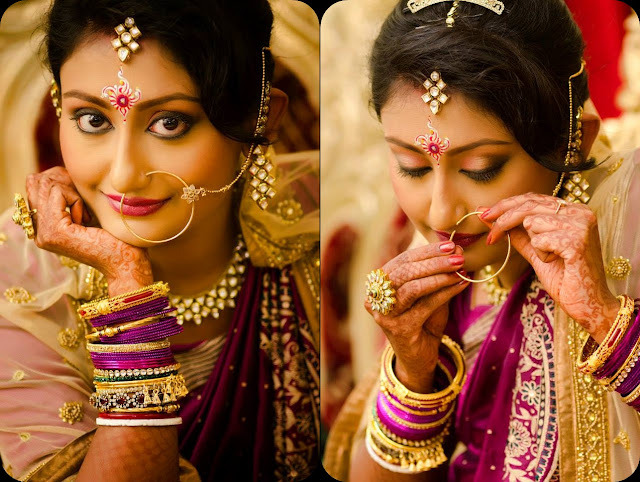 To complete and complement her look she went for beautiful kundan jewelry. She looked like a queen on her reception day. This time she was given a soft peachy smoky eye look. 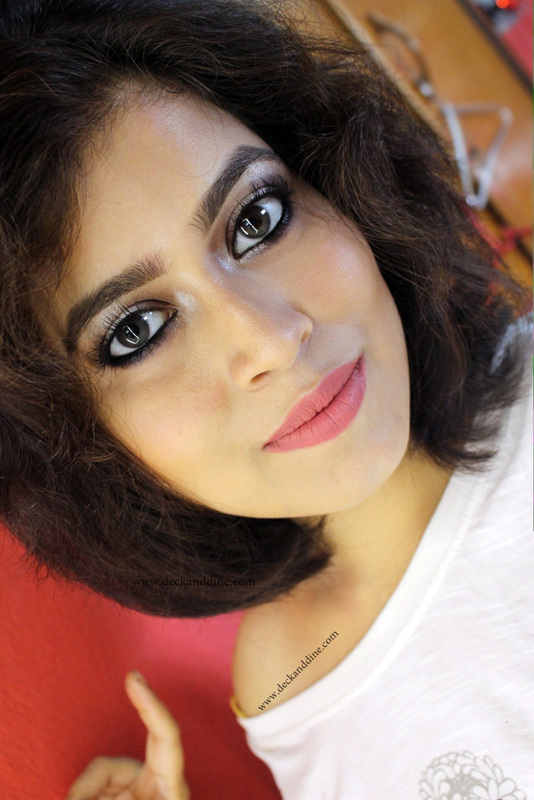 A satiny peach colored eye shadow was blended with black on the outer corner. Kohl was applied on the eyelid and smudged a bit. The same kohl was used further on lower lash line. Finally mascara was used to complete her look. Her lips were colored in a stunning hue of plum. For her reception she chose to wear a plum colored Bangalore silk with aari stitch. The veil was a sequined golden one. 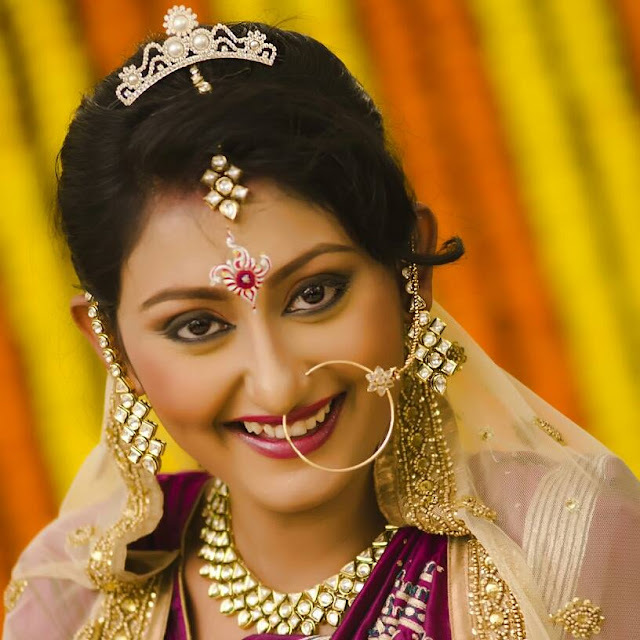 She wore heavy kundan jewelry to round off her look. She really had planned everything well. No wonder she is our favorite bride even 3 years after their marriage. She is one of the most beautiful brides I have ever seen. Her makeup, saree draping, hairdo were perfect and she looked stunning. Don’t you think so? Make Artist: Ujjwal Debnath. To check his FB page, click here. 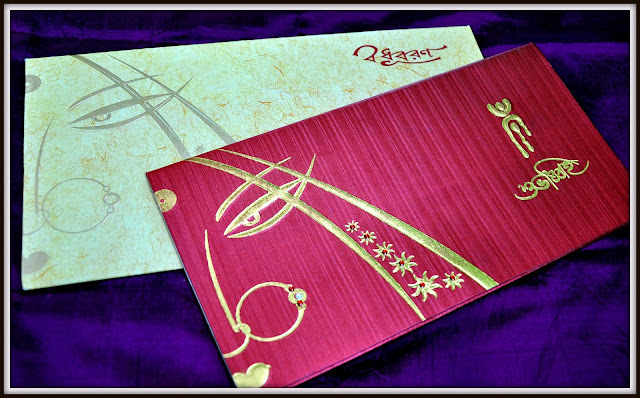 Thank you for the wonderful post dear :-) It was a pleasure re-living those days through your post. 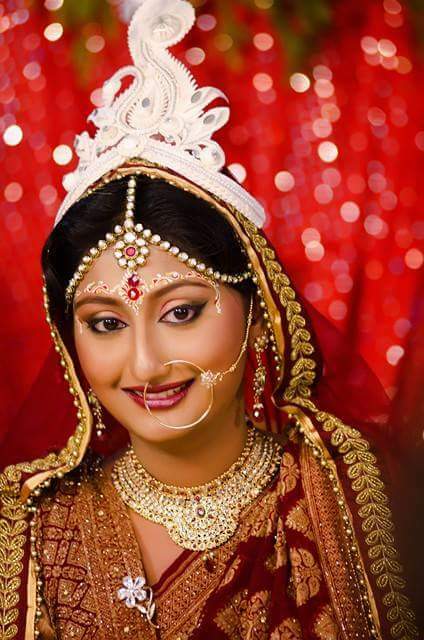 Hi Sanandita could you tell me you got your saree and veil from for your wedding ( the georgette saree and the red veil)? What a gorgeous bride !!! You are Looking amazing Sanandita. 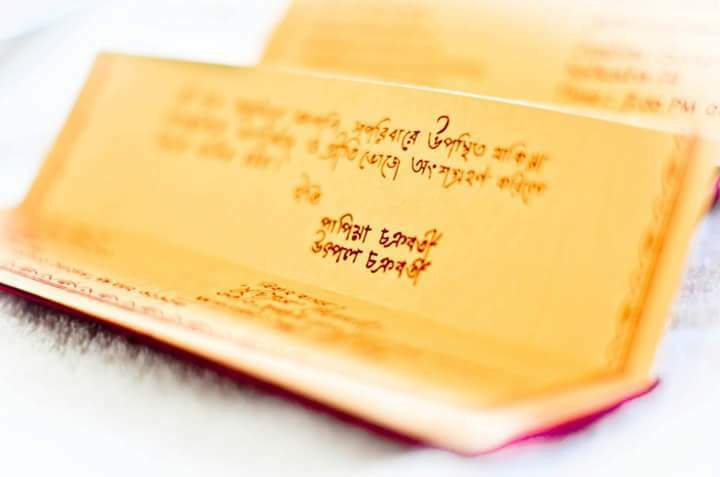 Could you please explain from where and how you print your father's handwriting in the wedding card? You are looking beautiful!!! Your jewelry has made your look more elegant & royal. Have a happy married life!! !